Knitting rocks in my favourite yarn, Herdwick, will be a lifelong project. 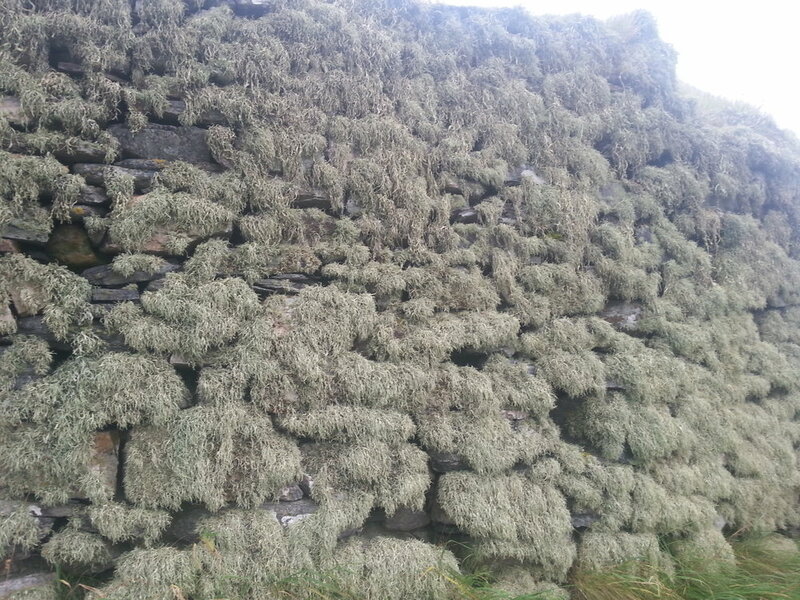 Dry Stone walls are as infinite as knitting, need mending like knitting, are a meditation like knitting. The varying colour and texture of Herdwick reminds me of the Cumbrian geology. Studying patterns in rocks and trying to knit them, helps me understand the structure of knitting. Some rocks are ‘relics,’ where I knit something like a fossil or fake archeological find. ‘Dry knitted stone walling’ instructs me as to what type of rock to knit next. Some rocks fit together, some don’t, and these relationships are always chance. Building soft walls and then taking them down again, makes me think about the space I am working in, why it needs to be divided, strengthened or why something needs to be enclosed. I also like to make heaps like cairns, guiding the way in fog. My walls don’t pile that high yet, possibly because I don’t have enough of the larger stones. The lack of weight in knitted stones makes balancing hard, but so much fun. Itchin to felt litchen on knit rock.